Recently, WAS was involved a lot in the organizing for better contracts in the social services sector, so we talked about this topic. WAS informed about another of their positive actions on their website. It was about a problem of their member in an IT company. We also asked about the campaign in the hospitality sector, since our last two conflicts were also in that sector. Unfortunately, since there was no response to the campaign, WAS stopped these activities. We were also interested in the recent protests against the 12-hour working day. According to one of the comrades, the change in the law has mostly “cultural” effect, as it creates an environment where bosses can be more daring and demand longer working hours from the workers. As for the program of the event, it began with a reading of workplace experiences (work refusal, slacking, sabotage), which the audience had a good laugh at. Afterwards, worker and antifascist songs were presented, accompanied by acoustic guitar and contrabass. Classics like Bella Ciao and Solidarity Forever couldn’t be omitted, but there were also less known songs that originate in the Austrian workers movement. We also managed to see part of the performance of young musicians from Rojava. We spent the remaining time talking with comrades from WAS. We were happy about the meeting and we didn’t know at the time that we’d repeat it a month later. This time in Bratislava at a political street festival. A short report written by WAS follows below. 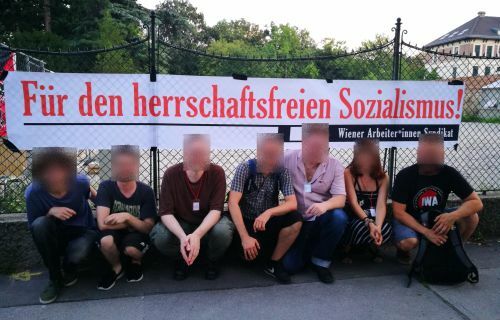 Comrades of the PA und the WAS at the benefit party in Vienna. On 29th August a delegation of the Wiener Arbeiter*innen Syndikat (WAS) visited the Slovak comrades of the PA. They invited us to a street festival on the occasion of the anniversary of the Slovak National Uprising. The 29th is a Slovak national holiday, on which they celebrate the resistance against fascism in the year 1944. 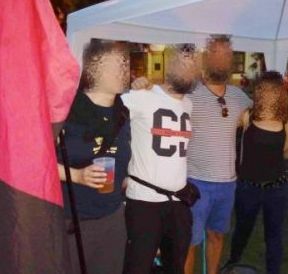 The street festival against fascism is organized by emancipatory groups in Bratislava. It took place in the city center with information desks and live acts. The PA also took part with an information desk about their union work and campaign called “Problems at work?”. In this relaxing atmosphere we had a lot of time to continue our talks from our meeting in Vienna at the benefit party, to get to know each other better, exchange union experiences and think about further common activities, for example another meeting in order to have a more structured experience exchange. We are happy about the refreshment of our contact with our sister union PA and look forward to further common activities. Members of the PA and the WAS on the street festival in Bratislava.